NOVACASA Kitchen & Bathroom Integrated Supplier is committed to promote an advanced business concept of kitchen and bathroom integration.With an overall design concept, exquisite techniques and strict sense of quality, we design and produce customized kitchen and bathroom products for our clients.We offer up-to-the minute designs in kitchen and bathroom furniture, brassware, sanitary wares, fittings, and a wide variety of wall/floor coverings. 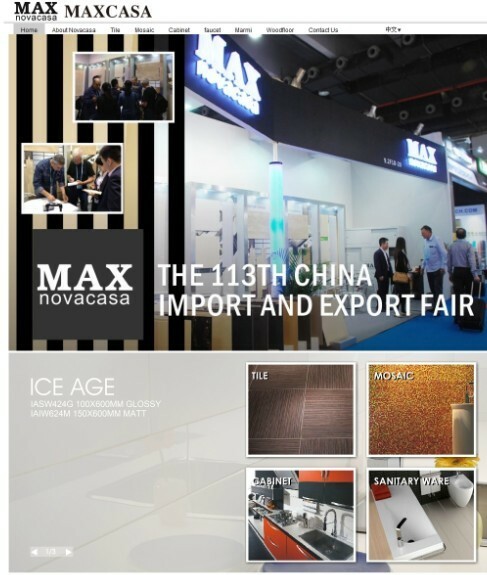 MAX is our ceramic tile collection which based on the latest trend in wall and floor coverings. We dedicated to show the beauty of fine materials like wood, natural stone, etc. with an art that comes from the past. With the presence of our in-house design team and technicians, we do researches and develop our own product lines that is unique to the others.Inside this book, we would like to impress you with a combination of Artisan Skill and high technological content.